The John C. Maxwell Leadership Center at 12Stone Church in Atlanta honors the life and impact of John’s global and generational leadership as an internationally recognized leadership speaker, author and pastor. In celebration of his continuing legacy, visitors today experience interactive audio-visual presentations ofMaxwell’s life and achievements across an immersive video wall controllable from several user stations. The engaging video and graphical content is driven exclusively by Renewed Vision’s ProVideoPlayer 2 (PVP2) software, bringing reliability and quality to a cost-efficient playback infrastructure. The PVP2 software resides on a Mac Pro at the core of the operation, delivering two display port signals to a DVI adapter to transport signals to the video wall. 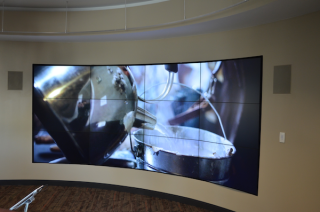 With the video wall arranged in a 4x3 configuration, Velocity Productions programmed the PVP2 software to split the wall into two, 2x3 sections, sending each a 1920x1080 image. The video monitors then break up the video signal across all monitors in each 2x3 section. Next to the video wall, visitors can trigger content using a Savant Systems six-button controller to drive the first level of interactivity.